You are viewing the archived Grain & Seed Bread Ratings page. Follow this link to view the current Grain & Seed Bread ratings. 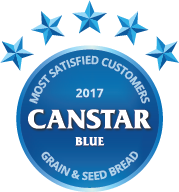 Canstar Blue reviews grain & seed bread from Abbott’s Village Bakery, Bürgen, Helga’s, Tip Top, ALDI, Coles and Woolworths based on factors including taste, texture, freshness and value for money. Canstar Blue research finalised in February 2017, published in March 2017. In our latest ratings for grain & seed breads, Abbott’s Village Bakery was the standout brand, scoring five stars on overall satisfaction, as well as taste, texture and variety. It tops the table ahead of Tip Top, Bürgen, Helga’s and private labels from Woolworths, Coles and ALDI. Forget about your plain white and wholemeal breads, you’ll now find a wide range of different loaves that fall under the banner of ‘grain & seed’ in your local supermarket. They might be more expensive than your average loaf of bread – whether it’s a big name brand or just the supermarket chain’s own private label – but there’s no doubting the popularity of grain & seed breads in Australia. But which brand delivers the best grain & seed bang for your buck? Do the big brands have it locked down, or are the cheap alternatives just as tasty? Those are questions our annual review aims to answer. To find out which grain & seed breads are most popular, we surveyed 3,000 consumers and sought their feedback on the bread they most recently purchased and ate. We asked them to rate their brand based on factors including taste, texture, freshness and value for money, with their opinions reflected by the star ratings you see above. Given their popularity, there are more options when it comes to grain & seed breads than any other type, with the big brands boasting several variations to their products based on different type of grains, seeds and oats. Indeed one of the big names has topped our customer satisfaction ratings – Abbott’s Village Bakery. Abbott’s Village Bakery achieved five stars for overall satisfaction, as well as variety, taste, and texture. Other big brands – Bürgen, Helga’s and Tip Top – all rated four stars overall, as did supermarket chains Coles and ALDI with their private label grain & seed options. Woolworths achieved three stars. Other notable outcomes were top marks for Bürgen on texture, and freshness, while the ALDI Bakers Life brand was the only one to rate five stars on value for money. When it comes to Abbott’s Village Bakery, you’ll find several different grain & seed breads, in addition to gluten free options and classic white and wholemeal breads. If you’re a lover of grain & seed bread, you are spoilt for choice. Canstar Blue commissioned Colmar Brunton to survey 3,000 Australian adults across a range of categories to measure and track customer satisfaction. The outcomes reported are the results from customers within the survey group who have bought and eaten packaged grain and/or seed bread from a supermarket or grocer in the last 3 months – in this case, 666 people.